No one ever said diplomacy was easy. Many have said it is messy. But one thing is certain: Diplomacy is better than destruction. Thanks to diplomacy, which weathered recent negative media cries of incompetence, the U.S. Secretary of State John Kerry has announced that the U.S. and Russia have reached what one news outlet called a “stunning” agreement. “In a stunning agreement that could lead to the end of the Syrian crisis, Russia and the U.S. announce a plan to eliminate Assad’s chemical arsenal. The diplomatic breakthrough in Geneva today is simply stunning. The “framework agreement for elimination of Syrian chemical weapons” reached by Secretary of State John Kerry and Russian Foreign Minister Sergey Lavrov delivers, in writing at least, just about everything President Barack Obama demanded when he threatened to attack the Assad regime earlier this month. The agreement, Framework for Elimination of Syrian Chemicals, was released by the U.S. Department of State in Washington. A major storm of political negativity is expected to greet the news in Israel, which had earlier massed its U.S. lobbying troops (AIPAC leading the charge) in a desperate effort to gain congressional support for a U.S. military assault on Syria’s chemical weapons sites. AIPAC failed to move even its most ardent admirers in a U.S. congress that knows its voters are weary of wars, and especially unwilling to become involved in Syria’s two and one half year old civil war. Secretary of Kerry was expected to fly from Geneva to Tel Aviv to brief Israeli leader Benjamin Netanyahu on the Framework. As he well knows, the issue with Israel is not so much Syria as it is Iran. Israel, with its own heavy arsenal of nuclear weapons stashed away in the desert, wants the U.S. to force Iran to give up any plans for building its own nuclear stockpile. Not attacking Syria, but turning the assignment over to diplomacy, was not what Israel, with Iran as its major target, wanted to see. News of the agreement drew immediate criticism from prominent Republicans in Congress,some of whom had supported the idea of airstrikes against Assad after last month’s use of chemical weapons, putting them briefly on the same side as Obama. Aware of the criticism ahead, but clearly pleased with the Framework Agreement, Kerry’s announcement in Geneva was forceful. 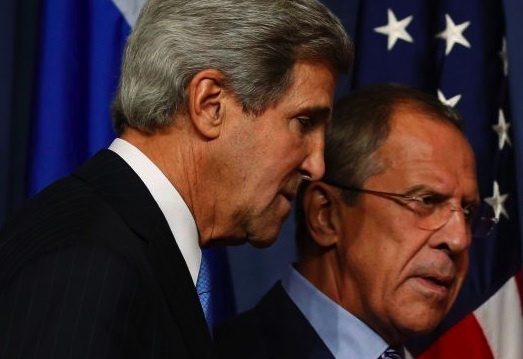 The picture of Kerry and Lavrov is by Reuters. It is from Ha’aretz. This entry was posted in Media, Middle East Politics, USA, War. Bookmark the permalink. The American people deserve credit for stopping this war. Congresspeople were inundated with calls, emails and petitions saying NO to an attack on Syria. To kill more Syrians and destroy more of their country, is hardly a way to help the situation. It is, in fact, pretty crazy and cruel. The American people stood up to AIPAC and other Israel Firsters pushing Congress and the administration for another war for Israel. This time, the American people, including most Jewish Americans, won against the Lobby. Now lets see if we can get Israel to give up its chemical weapons. Israel signed the Ban on Chemicals Treaty but , but it didn’t ratify the treaty, so it still has its chemical weapons stocks ready to use on any nation or people it sees as a threat. Of course Israel has hundreds of nuclear bombs ready to go at a moments notice as well, and will keep insisting that only Israel be allowed to have nuclear weapons in the region. Will the world do anything to enforce parity? No, not as long as Israel has AIPAC and its supporters to keep our government in its pocket. It’s not an easy song to sing, Jim, but it sure as hell stirs our hearts with hope. I’m finding a lot of “Syrian Firsters” are clamouring for war too. But heck, making friends with a large group of arabs who want to be freed from 40-years of dictatorial, autocratic rule, I guess, isn’t in our best interests. You guys would rather support dictatorships and theocracies. Swell! Fred says the American people deserve credit for stopping this war. Whilst I applaud the Americans who opposed the Administration’s declared intention to embark on a fresh round of international gangsterism, the person who really deserves all the credit is actually the Russian President, Vladimir Putin, who stopped the war.